A Novartis GSK deal has been struck in which they swap assets and combine their consumer health units, the two pharmaceutical giants announced today. Novartis is to buy GSK’s (GlaxoSmithKline’s) cancer drugs section for $16 billion and GSK will by Novartis’ vaccines division (excluding flu) for $7.1 billion. In the Novartis GSK deal, the two companies will also merge their consumer divisions “to create a world-leading consumer healthcare business,” Novartis wrote today in a press release. Consumer healthcare refers to non-prescription products, including nutrition, oral care, wellness, skin health, and OTC (over-the-counter) medications. Novartis International AG is based in Basel, Switzerland. It employs 119,000 people. GlaxoSmithKline PLC is based in London, UK. It employs 99,000 people. 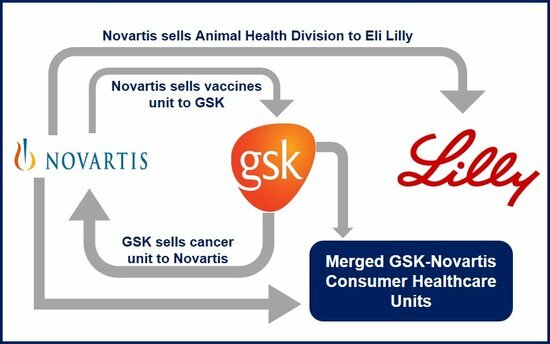 Is the Novartis GSK deal (plus Eli Lilly) the beginning of a new industry trend? In the Novartis GSK deal, Novartis agrees to buy GSK cancer medications for $14.5 billion and up to $1.5 billion contingent on a development milestone. Novartis will also have opt-in rights to Glaxo’s current and future cancer drugs under development. GSK has agreed to buy Novartis’ vaccine business, excluding its flu products, for $7.1 billion plus royalties. In the Novartis GSK deal, $5.25 billion is paid upfront and up to $1.8 billion in milestones. GSK Consumer Healthcare and Novartis OTC will merge, creating what the two companies describe as a world-leading business. When the merger is complete, Novartis will own 36.5% of the joint venture with eleven seats on its Board. Novartis says it will also have customary minority rights and exit rights at a pre-defined, market-based pricing mechanism. It has been an exciting week in the global pharmaceutical industry. On Monday reports circulated that Pfizer intends to acquire AztraZeneca (AZ). According to merchant bankers, the British multinational (AstraZeneca) resisted a takeover attempt from the world’s largest drugmaker (Pfizer). Most experts expect Pfizer to make another takeover bid for AZ.